White Mulberry, also known as Morus Alba is a native Asian plant that has traditionally been cultivated as a food for silk worms, but is fast becoming a popular health food thanks to research showing its ability to control blood sugars and also assist with alleviating stress. Where Does White Mulberry Come From? 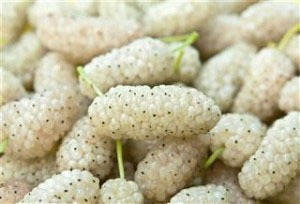 White Mulberry is a native plant to Northern China but has since been spread through many countries including India, Afghanistan, Iran and all the way to Southern Europe. Many parts of the part are considered therapeutically useful including the fruit, bark and leaves, however the plant is still being used primarily as a feedstock for silkworms as well as a other livestock species during drier periods. Traditional Chinese Medicine has used White Mulberry for a variety of conditions. The fruits have been known to assist with greying of hair, constipation and diabetes while the bark has been used for coughing, as a diuretic and assisting with fevers, headaches and irritated eyes. White Mulberry has also been shown in studies to have strong antibacterial and antioxidant function with different parts of the plant exhibiting different antioxidant strengths with the most being from the barks to fruits to leaves1. There has also been research showing White Mulberry to be a potent cognitive enhancer due to its ability to act on phosphodiesterase type 4 enzymes2 which when blocked have been shown to assist with depression, Alzheimer’s3, Parkinson’s4, wakefulness5, long term memory6 and neuroprotection7. Other researched possible benefits of White Mulberry include positive interactions with cancer8, cardiovascular issues9, asthma10, joint health and inflammatory conditions such as arthritis11. Besides the above effects, White Mulberry or Morus Alba may have multiple benefits on exercise performance and training. Perhaps the most well studied of all positive effects of White Mulberry include its ability to affect blood sugar levels12. A variety of mechanisms have been posited but it is believed that compounds such as quercetin, chlorogenic acid and rutin13 may affect mechanisms in the body which are involved in glucose metabolism. Extracts from Mulberry leaves have been shown to inhibit absorption of carbohydrates; sugars rather than starches making it a potential fat loss ingredient14. Similar extracts have shown appetite suppressing15 and hypolipidemic activity, making White Mulberry an increasingly interesting fat loss ingredient. In terms of performance, White Mulberry may help to decrease fatigue due to its adaptogenic (stress reduction) qualities and also may alleviate anxiety16; an important detractor of competition performance for some exercise events. There haven’t been too many studies on the toxicological effects of White Mulberry with most studies noting non-significant side effects. Due to its ability to reduce blood sugar levels; one should use caution with it in the off chance that it could lower your blood sugar too much to cause hypoglycaemia. Although research is lacking, it is best to avoid using White Mulberry during pregnancy or breastfeeding. One of the biggest negatives regarding White Mulberry is the lack of human clinical trials and studies with the vast majority of the research being animal studies. Recommended doses vary depending on the positive effects you’re after with improvements in inflammation occurring at lower doses of between 220-3,600mg. For the reduction of carbohydrate absorption, doses typically depend on the 1-deoxynojirimicin content however general doses range between 5,400mg up to 18,000mg. There are no conclusive recommendations on supplement timing, however like most carbohydrate blockers, it might be best to consume it before a meal. White Mulberry is most commonly sold as an individual supplement but has been found to appear in some “Greens” supplements and “Superfood” supplements. With its growing popularity and research, it’ll most likely start appearing in pre-workouts and fat burners soon. White Mulberry tends to work synergistically with a variety of other ingredients, most notably Roselle or Hibiscus Sabdariffa17 as well as Schisandra Chinensis; another adaptogenic plant. White Mulberry can easily be stacked with most supplements but may work best with fat burners and pre-workouts thanks to its carbohydrate absorption inhibiting and fatigue reducing abilities. 1. Khan MA, Rahman AA, Islam S, Khandokhar P, Parvin S, Islam MB, Hossain M, Rashid M, Sadik G, Nasrin S, Mollah MN, Alam AH. ‘A comparative study on the antioxidant activity of methanolic extracts from different parts of Morus alba L. (Moraceae).’ BMC Res Notes. 2013 Jan 19;6:24. doi: 10.1186/1756-0500-6-24. 4. MF, Beal; Cleren C, Calingasan NY, Yang L, Klivenyi P, Lorenzl S (2005). "Oxidative Damage in Parkinson's Disease". U.S. Army Medical Research and Material Command Fort Detrick, Maryland 21702-5012. Retrieved 2009-11-13. 5. Lelkes Z, Alföldi P, Erdos A, Benedek G. (1998). "Rolipram, an antidepressant that increases the availability of cAMP, transiently enhances wakefulness in rats". Pharmacology, Biochemistry and Behaviour.60 (4): 835–9. 6. Barad M, Bourtchouladze R, Winder DG, Golan H, Kandel E. (1998). "Rolipram, a type IV-specific phosphodiesterase inhibitor, facilitates the establishment of long-lasting long-term potentiation and improves memory". Proceedings of the National Academy of Sciences of the United States of America95 (25): 15020–5. 13. Hunyadi A, Martins A, Hsieh TJ, Seres A, Zupkó I. ‘Chlorogenic acid and rutin play a major role in the in vivo anti-diabetic activity of Morus alba leaf extract on type II diabetic rats.’ PLoS One. 2012;7(11):e50619. doi: 10.1371/journal.pone.0050619. Epub 2012 Nov 21.